Everyone has a smartphone or two these days, and no matter what you hear from the chatter of the tech world, don’t believe their words. They may tell you that computers are history. Because it is absolutely not true. Computers are the core of financial, educational, and business institutions. Gamers rely on PCs too. But there is a problem. It’s not a very complicated issue. The thing is, we can’t take our computers with us everywhere like we do with smartphones. Not unless your system is a laptop of course. But what if even the laptop you have is an Apple Mac? What if you wanted to use Windows on it? Sometimes you may have no choice, a client may ask you to use a specific Windows program, or your college may require you to use a specific application, for your classes, and some programs are only available for Windows. You could go the easy way, and install Windows on your Mac, using BootCamp. But what if you wanted to use a MacOS app when you are booted into Windows? Are you going to reboot the device to work with the app? And then what happens, will you boot back and forth between the two operating systems? Not only is this a time-consuming process, it is also a highly unproductive way to work. Instead of going through the tedious process, what you need to do is opt to install Windows in a virtual machine on your Mac. The other way around is an option too, but can you run MacOS apps as if they were Windows apps? Impossible, right? But if you were to install Windows on your Mac, you can run Windows applications, as if they were part of MacOS itself. This is absolutely possible, with an app specially designed for this purpose. And it is called, Parallels Desktop for Mac Pro. So, why is it the best choice for a virtual machine app? Let’s see its capabilities, shall we?. First of all, Parallels Desktop is an incredibly user-friendly app. Don’t worry about a complex installation process. Even, installing Windows on a Mac is as simple as installing a regular app. Once you have installed Parallels Desktop on your Mac, to be precise, inside your MacOS, all you need to do is choose one of the many available options to get Windows to work on it. And this is actually pretty easy. 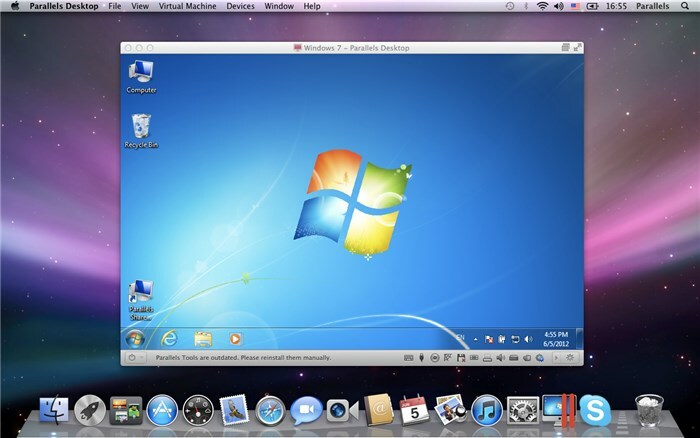 You can either import an existing installation of Windows from a PC, and migrate to your Mac, using Parallels Desktop Pro, and it will have all of your content, your applications, ready to use. What if you have Windows installed in Boot Camp? Can you import that too? The answer to that is yes, kind of. Parallels Desktop Pro can be set to start from boot camp directly. But this is not a very good idea, as it has quite a few limitations compared to a direct copy of Windows. A boot camp installation of Windows cannot be paused, or saved as a snapshot, or run in Rollback Mode. Neither is compression possible with the Parallels Desktop Pro. So, what we recommend is, to either migrating your existing Windows, and work on it as a virtual machine, or install a fresh copy of Windows in your MacOS. Speaking of which, how do you install Windows using Parallels Desktop Pro. You can install Windows using an ISO imge, or a DVD copy, and the app will work with either. That’s pretty cool, right? But what if you don’t have a license of Windows? There is a good chance of that, because you are after all, a Mac user, right? So, allow us to tell you that you can buy Windows 10 from Microsoft, using Parallels Desktop Pro. lets you buy a new license for Windows 10 directly from Microsoft. How cool is that? One important thing to note is that you are by no means restricted to use only Windows 10. You can install any version of Windows from XP, Vista, 7, 8 or 8.1 and use them too. Actually, you can also install other operating systems too. Parallels Desktop Pro offers full support for Linux distros such as the popular Ubuntu OS, and other Unix based OS, and even Google Chrome OS. Now that you have installed Windows on your Mac, how do you boot the operating system? There are multiple ways for this too. Another way, which is much faster to start Windows, is to run a Windows program installed in your MacOS. Yes, that’s right you can run Windows apps as if they were native to MacOS. Doing so will start Windows and the app which you wanted will be opened. Installing Windows programs is very simple. Just run the setup file, like you would on a real Windows PC, and the app will be installed on your Mac. You don’t have to worry about any lags or performance issues when running a Windows app, because Parallels Desktop Pro is designed to optimize the virtual machine in real-time, so that all programs run buttery smooth. Open the Parallels Desktop Pro app, and click on the Control Center option from the MacOS menu bar. Select the power button, which is available right below the Windows installation listed there, and this will start Windows. Once you have installed Windows programs, you can actually run them from the MacOS dock too. The important thing is that Parallels Desktop Pro, allows MacOS’ native features, such as Launchpad, Mission Controls etc to be used with Windows apps. If you wish to use MacOS’ file manager, Finder Tabs in a Windows app, or Force Touch get definitions in the results, you can do that. Parallels Desktop Pro has a special feature called Coherence mode, which allows you to use both Windows and Mac applications at the same time, and that too on the same desktop. You can switch between the applications, and multitask as if they are from the same operating system. Multi-tasking reminds me of something. Parallels Desktop Pro supports a massive 64GB of VRAM, and up to 16 virtual CPUs per virtual machine. You also get 2GB of video memory. So, with a mountain of memory at your disposal, you can forget about lags. In fact, you can run the most demanding of Windows programs and still, experience the best performance. MacOS’ Time Machine is fully supported, in Parallels Desktop Pro, so you can save Snapshots, to rely on, and revert, if things don’t go well. It is not enough to simply install Windows, or programs for it. You need files to work with it, right? And copying files from macOS to Windows is easier than you think it is. You can copy and paste files, as if you would do so in macOS, or simply drag and drop files between the two operating systems. This works with text to, the copy and paste I mean. You can share your hardware devices and all of the ports on your Mac, to work with Windows. So you can use Parallels Desktop Pro to enable your USB Type-C port, or Retina Display, or Force Touch, or the Thunderbolt port or Firewire port, and every device, which you have connected to the machine, to be used between macOS and Windows. So, you don’t have to invest in third party apps, to work with these devices. Parallels Desktop Pro for Mac has tons of other features including support for nested virtualization (for Linux), guest OS debugging, Power Nap, DirectX 10, and many more. Want to use Mac dictation, Mac OS parental control, in Windows? You can do that using the app. It even lets you open websites in Microsoft Explorer, from the Apple Safari browser. It also lets core Windows 10 features such as Cortana (the personal digital assistant) in macOS, and also the Action Center complete with the notifications, which will be displayed in the Mac Notification Center. You can easily create new Virtual Machines, from VHD and VMDK disks. And that’s not all of its features. Parallels Desktop Pro has a superb online storage solution, powered by Acronis. You will get up to 500GB of space for free, and the backup process itself, is incremental, meaning that any changes you make to the files, are saved to the cloud, and new files would also be uploaded. As a bonus, you are eligible for 24 x 7 premium phone and email support, from Parallels Access. If your office works with developing code, you will be happy to know that Parallels Access Pro comes with a Microsoft Visual Studio Plug-in, and supports Visual Studio, Vagrant, and Jenkins. Parallels Desktop Pro is absolutely the best solution for Mac users, who wish to use Windows on their Apple machines. The user friendliness of the app, and that you can use Windows and macOS apps without rebooting. adds to the factor, that makes it have a must have for every Mac user.